Claude Houghton. I AM JONATHAN SCRIVENER. Thornton Butterworth, London, 1930. One James Wrexham, an impoverished but well-educated Englishman past his first youth answers an advertisement in the London Times and becomes secretary to the mysterious, invisible Jonathan Scrivener. He never sees his employer, who goes abroad after hiring him (solely on the strength of his letter of application.) Wrexham’s only duties are to live in Scrivener’s London flat, catalogue his library, receive his friends, write occasional reports to his absent employer. One by one Scrivener’s friends turn up in search of him, get acquainted with Wrexham, tell him what they think of Scrivener. 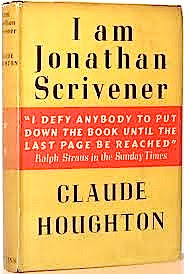 Each description is different…who exactly is Jonathan Scrivener? OK no-one utters the word 'Rosebud' but it is credible as an input for the 'greatest film ever'. The book was a best- seller in its day, especially in USA and the Penguin paperback sold 100,000 copies. ABE has 6 Penguins from £5 to £25 the latter price for a fine copy in a near fine d/w. Penguin jackets often turbo charge prices….The hardback British first can go for £160 fine in jacket and the Simon and Schuster first USA for a little less, although some patient dealers want $200+ for copies sans jacket. Henry Miller wrote in The Books in My Life that 'it would have made a wonderful movie' and there is even speculation that Godot came out of it, possibly Sam B read it, there was even a French edition Je suis Jonathan Scrivener. The IMDB database shows that it was filmed for TV in 1952 in the Studio One in Hollywood series. The French edition of 1954 has an intro by Henry Miller. At the recent auction of some of Peter Howard's stock in Los Angeles I managed to acquire the typed/ corrected manuscript of the book. I look forward to cataloguing it when it arrives back in the UK. It came with the MS of his novel The Riddle of Helena and the cataloguer records that Claude Houghton (1889-1961) 'enjoyed success as a writer of metaphysical thrillers.' Another cataloguer notes that he was admired by P G Wodehouse and Hugh Walpole. Doubleday, his American publisher described him as 'this fascinating romantic mystic...who insists that there are more spiritual worlds than this one in which we live and that it is man's chief business to discover his relations to these worlds." Fittingly, four of his novels are listed by E. F. Bleiler in his Checklist of Science Fiction and Supernatural Fiction under such categories as 'mental aberration' 'after death experiences 'visitors from other worlds,times' and 'Supermen.' All the Bleiler titles are obtainable, often signed, at fairly reasonable prices. In his day he was compared to D.H. Lawrence and Emily Bronte, because like both of them he had made a decisive break with the 'novel of manners.' He now belongs in the honourable category of forgotten or even neglected writers but in the 'long tail' of consumer demand his books are likely to be always saleable. Was Scrivener a snow sled? 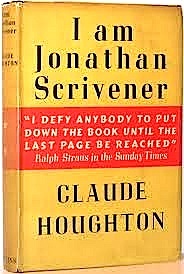 The way in which Scrivener is described by his friends reminds me of the various reactions Bartleby in Melville's "Bartleby, the Scrivener." I wonder if Houghton's choice of name was a deliberate bow to Melville. Thanks Nigel - he is completely new to me and now on the list to read - and Gareth that indeed sounds very probable. 'metaphysical thrillers' makes for a great virtual shelf on which you could put John Franklin Bardin (Denis Healey's favourite novelist), Charles Williams and Geoffrey Household and others.